In Cars, one car tells another car how her town, Radiator Springs, became desolate and abandoned. She explains that a new freeway bypassed her town "just to save ten minutes of driving", as if this was some sort of travesty. This is amusing to me because the car she is telling is Lightning McQueen, a racecar who loves driving fast. The town in this movie, Radiator Springs, was based on the real-life story of Seligman, Arizona. Built on historic Route 66, Seligman shriveled to almost nothing after the completion of Interstate 40. 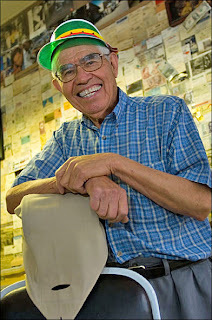 One Seligman resident, Angel Delgadillo, fought to preserve his town's legacy and livelihood. A barber by trade, Angel created the first Historic Route 66 Association. Through Angel's efforts, Seligman has become an icon of Route 66 history and also a popular attraction for tourists traveling between Las Vegas and the Grand Canyon. A few years ago I became friends with Angel, visiting his barbershop-turned-giftshop two or three times a week while working as a tour guide. Meeting Angel and hearing his story was inspiring for me (You can watch an interview with Angel in the special features of the Cars DVD). It is often said that the only constant in life is change. The key to making it through is not to gripe and mope if you get left in the dust. Changing jobs, acquiring new skills, and making an effort to adapt will only help you in the long run. It surely worked for Angel. I think Angel is pretty dang cute. Way to go for him. Yeah...if you don't make something worth seeing, no one will come to see it! And life does change. I think books are going out of style and blogs are coming into it. Maybe we've got a couple of years before that happens, but if not, publishing companies are going to have to adapt. Keep up the trend stacking Drew! Love the blog!